Oh no! I am not talking about the cat but I am talking about our gerbil Jerry. Tom now is missing his big brother. Jerry is always the trouble maker from our two gerbils. He is very active than Tom. Jerry escapes from the tank. I was sitting on the floor while doing my task in the computer two nights ago. All a sudden I see Jerry on the carpet. It is like I cannot believe what I am looking at. I am thinking how he escaped from the tank. I did spent sleepless night. I could not catch him. He is way too fast. My husband is working that night and I called him over the phone. I see Jerry in the morning but he is too quick. He hides underneath the refrigerator. I am sure he is fine because I see him again that day. I do not know how to catch Jerry, my gerbil, trouble maker. I am linking this entry to Camera Critters. 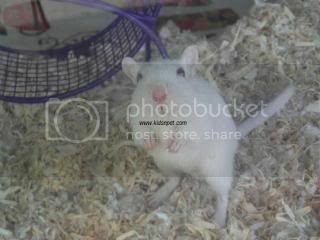 This entry was posted in gerbils, pets and tagged Jerry. Bookmark the permalink.